Jazz pianist Cyrus Chestnut is an innovator. His music is melting pot of all his musical influences, from his childhood playing in the Baptist church in his native Baltimore to playing for Betty Carter, Carla Cook, and Wynton Marsalis. I have been following his music since the mid 90’s when I purchased his Revelation album on an afternoon of random music shopping. Over the years, he has grown and matured musically but there is always a constant theme in his music. You know when he sits down at his piano, he is going to take you on an adventure like never before and you know there will be at least one or two hymns or spirituals included on every album. 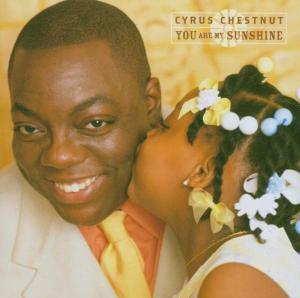 On his debut release for Warner Brothers Jazz, You Are My Sunshine, Cyrus raises the bar through the roof. He has taken songs that we have come to know, shaken them up, and given them new life and in between, he slips in his own bold compositions that make you stop and take notice. I had the pleasure hearing Cyrus live in concert earlier this year with his current trio of Michael Hawkins on bass and Neal Smith on drums. A few minutes before the concert, Cyrus was out greeting people in the audience and I got a chance to compliment him on the Soul Food album and his work with Carla Cook. He is soft spoken and his mannerisms remind you of an old soul very in touch with the past and able to use that wisdom for today. His concert was sensational. His set included Oscar Pettiford’s “Blues in the Closet”, “God Has Smiled On Me”, “Great Is Thy Faithfulness”, “Body and Soul”, “Duke’s Place”, and “I Can’t Help It.” His piano let out a thunderous roar as he intertwined through a variety of tempos. He brings all of his musical gifts together and result is just amazing. I dedicate this review with love to my jazz mentor, my Dad, who would have been 84 years young today. Enjoy your music. This entry was posted on Friday, December 12th, 2003 at 6:31 am. It is filed under Music Reviews and tagged with Cyrus Chestnut, gospel, jazz, You Are My Sunshine. You can follow any responses to this entry through the RSS 2.0 feed. At any and every family function where my 88 year old grandfather is present, we ALWAYS sing “You are my sunshine”. It is such a staple that even my 3 yr old girl knows all the words. Thank you once again for sharing such a wonderful artist. I think I’m going to add his Christmas disc to my collection. I bought his Christmas CD after hearing an interview with him in NPR awhile back–and I love it! The new release sounds like a winner. I will pick it up this weekend. Hi James, I want to listen to “You are my Sunshine” now. I’ve always meant to get around to picking up some of Cyrus Chestnut’s work and this convinces me that I should stop waiting. What a nice tribute to your dad. I love the way you write about music. Hope you’re surviving these last few pre-holiday days! Hey J – I LOVE this album and Cyrus. When I was 16, I got “schooled” in gospel playing piano where I was the only non african american. Listening to this album takes me back to that time – especially the songs What a Fellowship and Total Praise. I think Soulfood is probably my fav Cyrus album but this comes close!! !